Perez, C.; Rodriguez, I.; Torras, S.; Oliva, A.; Lehmkuhl, O. Considering the state-of-the-art in TES technologies, two-tank indirect system using molten salt is the most widespread within CSP plants. However, current techniques for design and optimization, as well as, for assessing the behaviour of these systems are mainly based on not-to-scale costly experimental set-ups. In this paper, a detailed numerical methodology modelling molten salt thermal storage tanks is presented. This methodology considers the transient behaviour of the molten-salt fluid, the gas ullage, the molten-salt free surface, the tank walls and insulation, different material in the foundation, radiation exchange between the salt and the tank walls in the ullage, the passive cooling in the foundation is proposed. Results for different configuration which allows an optimal design of the tank walls, insulation materials and tank foundations are presented. Perez, C. [et al.]. 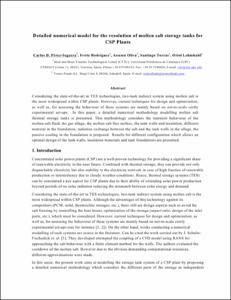 Detailed numerical model for the resolution of molten salt storage tanks for CSP plants. A: International Conference on Solar Heating, Cooling and Buildings. "Solar energy for a brighter future: book of proceedings: EuroSun 2012". Rijeka: 2012, p. 1-8.